A Little Bolt of Life: High 5 for Friday! I can't believe it's Friday again! Thank goodness for holidays during the week. (Althought it would have been nice to make it a long weekend, but it was a holiday nonetheless!) 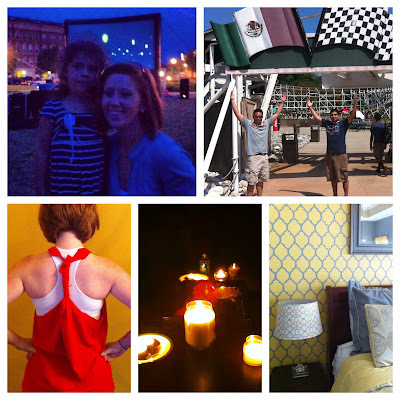 Below are 5 highlights to my week. 1. Watching movies on the lawn right outside our apartment complex with my niece! 2. Going to Six Flags with friends for the 4th of July! You can read all about the trip here! 3. My DIY workout shirt! I found the instructions at Rabbit Food for my Bunny Teeth. It took about 15 min to do and felt great to run in! 4. Losing power during a big storm and being one of the fortunate ones who was only without it overnight. Others in our area were without power for days!